Wanna see my bathroom?! How often do THOSE words pop up in your email?! 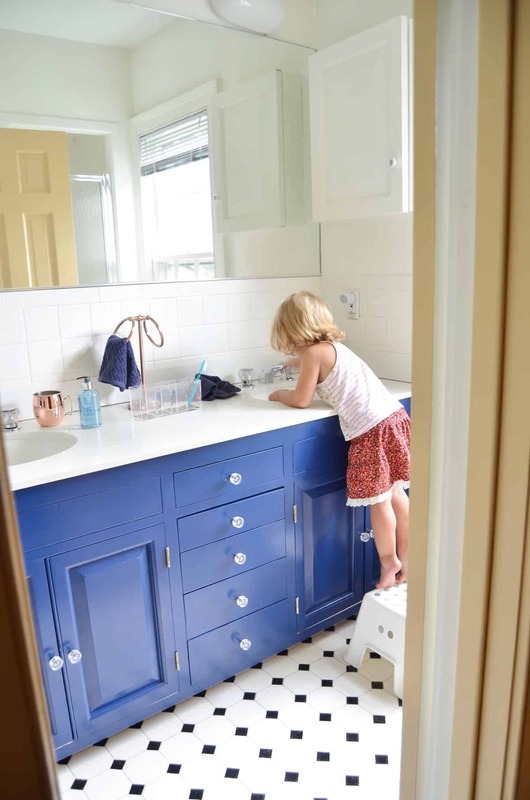 Today’s your day, folks… I’m sharing how AMAZING a simple coat of paint made the kids’ bathroom look. I have other plans for the space, but changing the vanity alone makes the room look BRAND new! Or at least of this decade. I’m THRILLED to be collaborating with Michaels and DecoArt for this post. 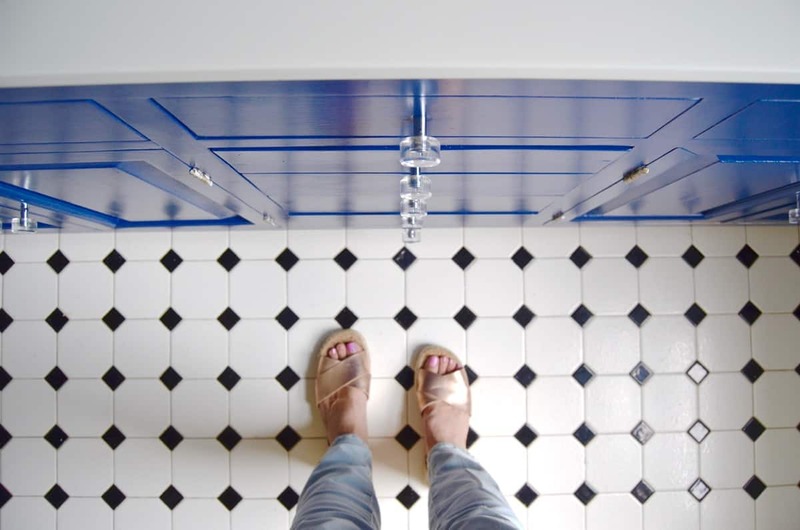 I’m using Americana Decor Satin Enamels paint here, but never fear… I LOVE this paint and would have used it anyways. (Ha… joke’s on them!) See my full disclosure policy here. 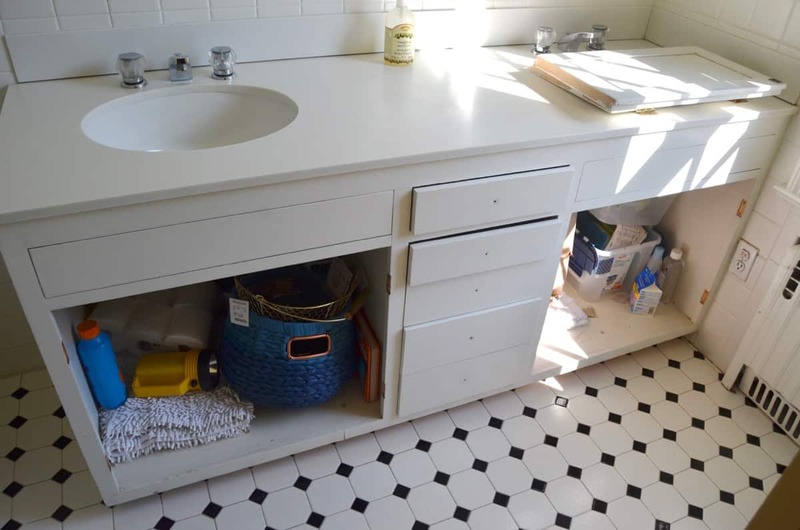 This vanity is all wood so I was anticipating a quick and easy makeover… I shared it on snapchat so 12 of you saw, but in a nutshell… Houston, we had a problem. Technically Americana Decor’s Satin Enamels requires no prep work. But regardless of the label, I ALWAYS do two things when painting: sand and clean. Even for a paint that says ‘no prep’, I sand to rough up the surface a bit and take off the sheen of the existing paint. And then obviously it’s important to clean the surface in order to remove any residual wax or grease or dust that may prevent the new coat of paint from adhering. For the kids room, I’m using Satin Enamels in Dark Denim. It’s the prettiest navy blue… very rich but still ‘blue’ if that makes any sense! 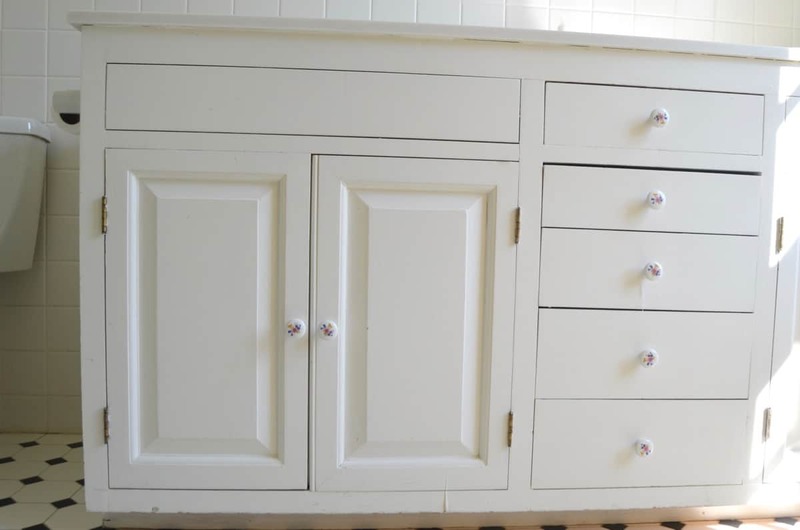 Once the vanity was prepped, it took two coats of paint and a few touch ups. I removed all the hardware and the doors. If you can believe it, I opted to replace the knobs. I’m telling you… hardware makes a HUGE difference!! I found these ones on sale here. 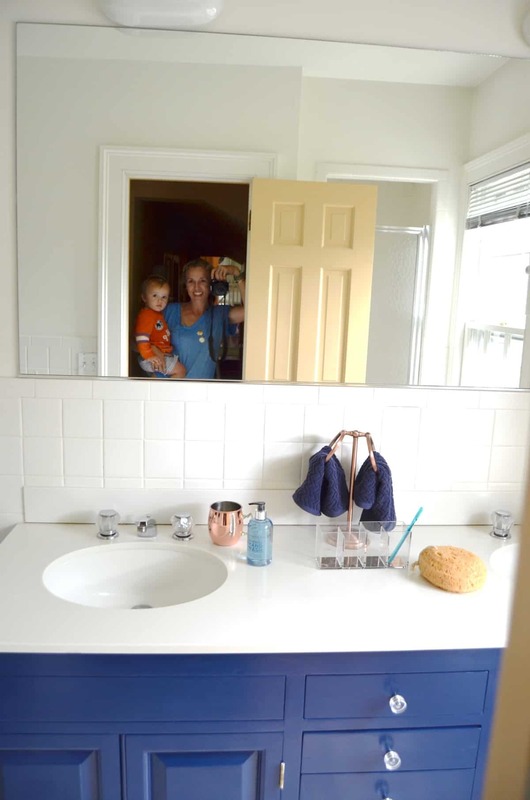 The hope is to bring in some copper elements (see vision board here), so when I replaced the toilet paper holder, I spray painted the new one with Rustoleum Gloss Enamel (affiliate) rather than leave it with the basic satin nickel finish. You’ll have to check back in throughout the fall to see the progress I make in here! 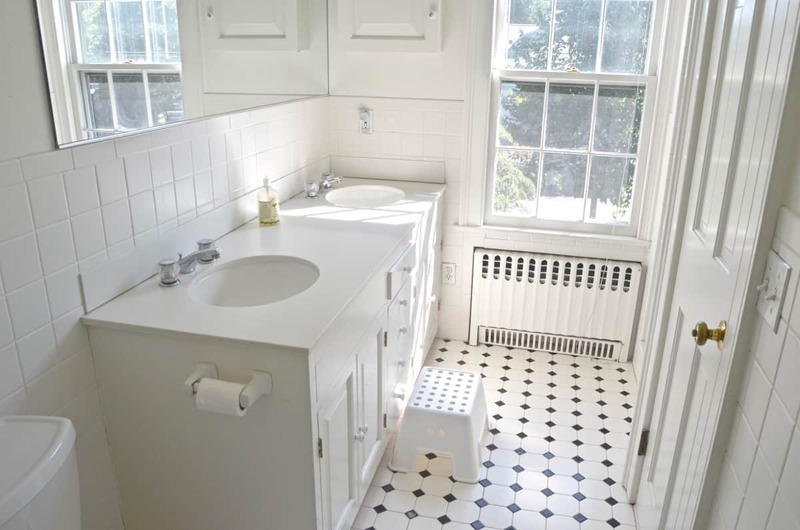 This bathroom is my FAVORITE type of makeover… I haven’t done ANYTHING major. No tiling. No plumbing. No electric (yet! )… but doesn’t the room look brighter and more modern already? Update: See the basically finished room HERE. New wallpaper, lights and accessories! Thanks again to my friends at DecoArt and Michaels for allowing me to jump start this room. 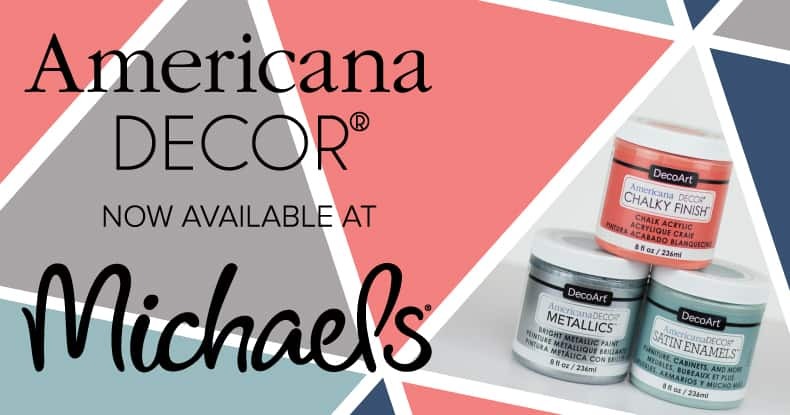 You can find Americana Decor Satin Enamels at Michaels in their stains and finishes aisle. 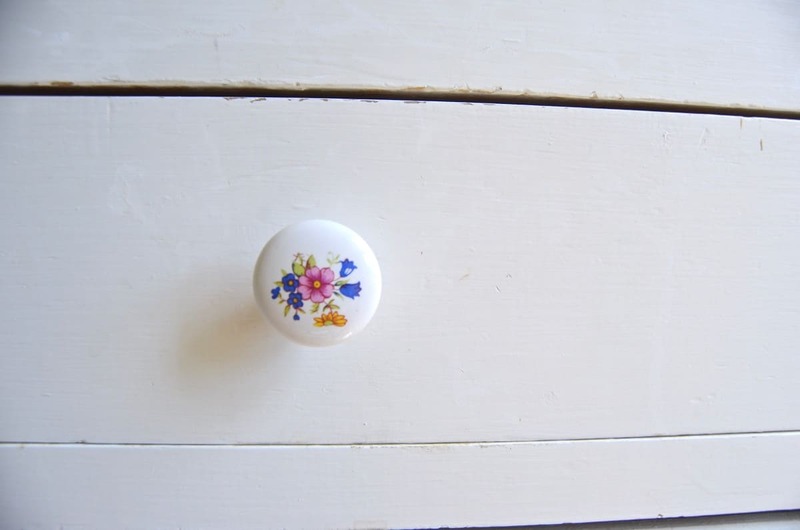 I was able to paint this ENTIRE vanity with just one 8-oz container! See all the other amazing colors here. oh come to me sweet baby navy blue vanity! 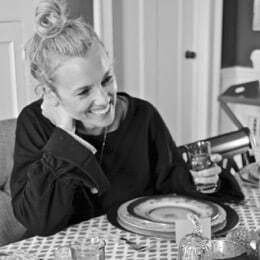 i LOVE this, charlotte! Oh my goodness, I love that blue so much! I’ve been using DecoArt paints more and more frequently, and I am so impressed. Can’t wait to see more!! lOOKS GREAT! dID YOU USE A TOPCOAT? iT LOOKS VERY SHINY FOR SATIN, SO THAT’S WHY i’M WONDERING. Nope. No top coat. 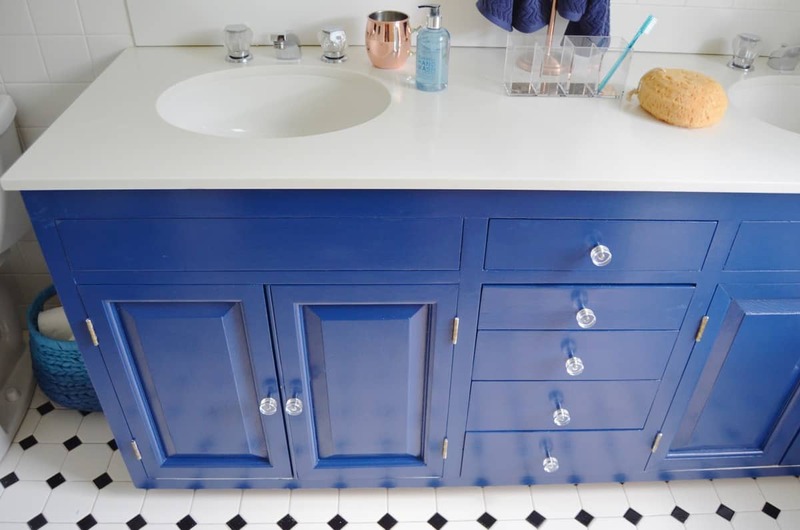 The paint itself is called Satin Enamels so it’s not necessarily a “satin” finish… I like that it has a bit more sheen especially in a bathroom!